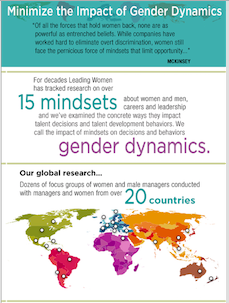 When it comes to overcoming mindsets that cause the leadership gender gap, one of the practices that we recommend is to require recruiters (internal and external) to deliver diverse slates of candidates for key positions. While companies often focus on senior positions, we recommend this practice be implemented for positions above the diverging point (the point at which the % of women begins to decline and that of men increases). The first time I heard the term elevator speech was in the middle of the dot-com bubble. I had been hired to design a three-day new employee orientation program for webMethods and the CEO was laying out the specifications. Among them he said this, "Everyone at webMethods must understand that they're salespeople. They must know our elevator speech and be able to pre-qualify potential customers anywhere they meet someone -- on the plane, at a cocktail party, at a conference."